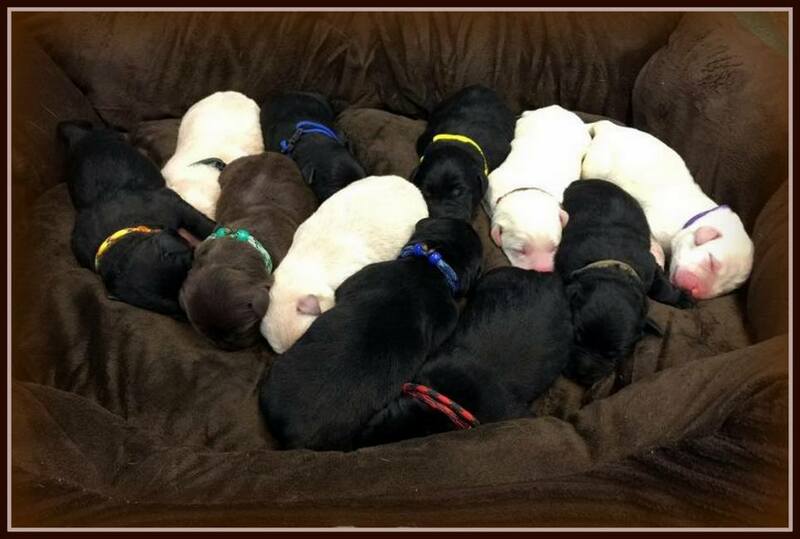 Puppies arrived January 24. Aurora is settling into motherhood nicely. As breeders, we are very sad to say that we lost one little one last night. In ten years we have only had one stillborn puppy, and have never lost one. This little black girl was very small and despite our ever effort and Aurora doing all she could...we were not successful. Aurora has handled this much better than we have. Nature is a wonderful thing and we must trust that this is simply the natural order of things. Newborns are very fragile, and the birthing process is truly amazing. There are so many things that need to go right, and this little one just did not survive. We are so careful, and strive to have the best whelping condiitons possible. Even when all goes right and conditions are ideal, God has another plan. We do trust in Him. We will focus on the beautiful babies that surely have a bright future ahead.